Participating Indigenous Peoples/Nation: Huay Manao village M.4, Doikaew Subdistrict, Chomthong District, Chiang Mai province, Thailand. 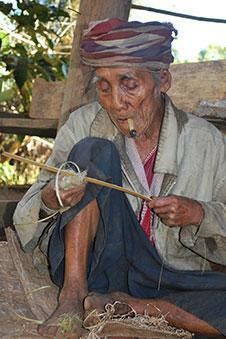 For the initially assessment we will focus only on Hin Lek Fai, one of satellite communities of Huay Manao village. It belongs to Karen indigenous group. To enhance indigenous peoples’ capacity in assessing impacts of climate change and their livelihoods and ecosystem and develop indigenous strategies to adapt to climate change based on their traditional knowledge. Indigenous peoples’ way of life is inextricably linked with land and natural resources. These are sources for their food, shelter, medicine and learning space from childhood till adulthood. Presently they are faced with a lot of uncertainties due to impact of climate change and government policies which directly or indirectly impact on their livelihoods. The I.P.F and Hin Lek Fai community therefore propose to use indigenous inquiry methods to assess the impact of climate change on their ecosystem. This will help them better perceive the problem and enhance their ability to adapt to climate change in an appropriate manner. Hin Lek Fai community depends largely on land and natural resources. They have categorized land use into three types: farm land, community forest and conservation forest. Spiritually, the villagers pay respect to Mother Nature and environment. They believe that there are guardian spirits that oversee all living beeings and other resources. Thus, the Karen residents are required to ask for permission from higher spirits to practice rotational farming as well as to utilize natural resources for their survival. Through many generations Karen people have accumulated their indigenous knowledge for natural resource management in a sustainable and environmentally sound way. Over the past years, villagers observed some signs of climatic change including decreased rain fall, unseasonal raining and a reduction of water levels in streams and loss of plant species. Climatic condition are getting warmer. This can be seen from increasing production of rice yields in higher altitude. Reduction of water level in streams in comparison to the past. Villagers explained that this phenomenon as a result of government policy on reforestation emphasizing the pine tree plantation (1984 – 1988). The people also related the widespread of caterpillars and insects to pine tree plantations. Women share their experiences in the disappearing medicinal plants. They are compelled to travel deeper into the jungle to collect these medicinal plants.